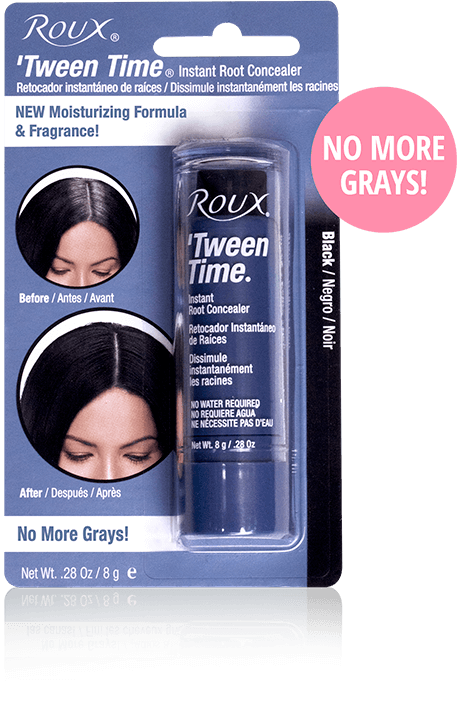 ‘Tween Time instantly touches up roots between haircolor applications and blends away gray. Instant color applies like lipstick with ease and precision. NO WATER REQUIRED. Apply new, moisturizing formula directly to roots or gray areas. Color stays until shampooed away. I love the new formula!!!! It goes on easy and doesn't look oily at all!! PLEASE BRING BACK ORIGINAL FORMULA!!!! I have been using the old formula for years and worked great. The new formula is like putting grease in your hair.... absolutely horrible- simply stated. Please return to producing original formula. Please bring back the original product. The new product leaves my hair so unnaturally black. Will not buy again until you bring back the old product. Gave it one star just so I could post a review. New formula makes your hair feel and look like you dumped tons of gel on it. Its disgusting and the perfume smell makes you want to throw up. Bring back the old formula. You have lost me as a customer. I have used this product for a few years now. Soooooo disappointed in the new formula. Why would you change it. I didn't realize it changed, I applied it like usual and went out, my hair remained wet, and sticky and never dried where I used it. It was all over my hands and all my pillow case. It's like shoe paste. PLEASE BRING BACK THE ORIGINAL FORMULA!!!!!! I GIVE THE OLD 5 STARS; THE NEW 0 STARS. I have been using Tween Time for years and like the old formula. The new formula is horrible. I gave it one star only because I was required to. I wanted to give it zero stars. Please bring back the old formula or at least offer both options. This new formula is too thick and gooey. It leaves my hair gummy and is difficult to disperse through the hair. Please bring back the original brand you use with water. It is much easier to use and control. I loved the old formula. I’ve been using it for years. The new formula makes me look like I haven’t washed my hair for a week, so I won’t be using it again!!!! PLEASE bring back the old formula! My hairdresser recommended 'Tween Time hair crayon for me about ten years ago. It's easy to use, reasonably priced, and you can find it in beauty supply stores or online. My selected color blends perfectly with my hair color and I've recommended it to several friends. I gave it one star in order to post review but the new formula is horrible. It is like globbing mud on your head when using it and the fragrance smell is way to strong. I had used this product for years in Light Brown. The old product went on so easily and left hair looking & feeling natural as if nothing had been applied YET did not run. The new formula is WAY too greasy (feeling and looking)when applied. And to add insult to injury, the new color choices do not match up. Bring the old formula back! PLEASE. I have dark blonde hair and I tried this product, where I did the touch ups it made my hair maroon or red in color. It looked awful. I will not be using it. The coupon I received had a picture showing the dark blonde/light brown tween was very light in color, the stick I received was reddish brown color. I have used the original Roux sick in dark brown for as long as I can remember. I recently purchased multiple sticks and was surprised to find a new improved version. I grabbed the new one off the shelf because I expected it to be the same or better. Trying the new stick was a nightmare! Not only was it darker but it left my hair feeling waxing and looking so grungey. Despite having somewhere to be, I decided to rewash my hair. The brown wax coated my tub leaving a tenacious nasty stain that required immediate scrubbing making me even later. After all that I had to attend my holiday party with sparkling gray roots. Unless I can buy the original formula, I will not buy or recommend this product to anyone! I have been a loyal costumer for maybe a decade and am hugely dissatisfied. I have used this product for years and loved it. I recently went to purchase and found that not only was the packaging different but the colors and product as well. The reason I gave a low rating was because of the colors. No where near the colors they were before. I've always purchased Light Brown and it was perfect. Now, it looks more Auburn in color and goes on red. Going back to store to maybe try Medium Brown but that one had looked dark brown to me when in the store. If it doesn't look right, I will be switching to another brand. Very disappointed! Somethings are just better left alone! Loved this stick before I stopped coloring my hair. PLEASE make this in white; not to cover roots, but it is a GREAT boost in making thinning hair look fuller.